I realize that I write about people-pleasing a lot! Why? Because it's one of those insidious behaviors that can easily take control of your life and leave you feeling powerless, which often leave vulnerable women turning to food. In this chat, I talk about how people-pleasing affects your weight loss goals. 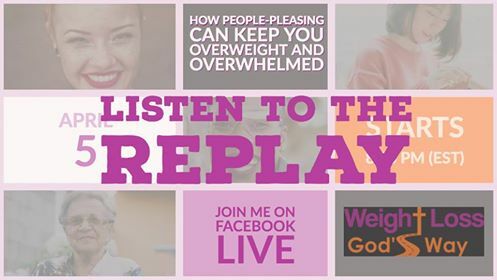 To learn more about how to overcome this behavior and others such as have a controlling spirit, being a drama-queen, and perfectionism, check out the Weight Loss God's Way, 3-Step Process for Permanent Weight Loss. That really was an awesome discussion. I can’t remember the girl’s name, but her mother had said she wouldn’t be able to find a husband. I had a similar experience, except it was from my husband. At 130 pounds, he told me I was fat and that I should run behind the car. I’ve struggled with my weight ever since, mostly hanging out around 180-200 pounds. I know it was my choice to turn to food. With this program, I’ll allow God to help me make better choices. Thank you so much Cathy for creating this program. I was certain that was not me… until I heard your example. The rest of the day I came face to face with pleasing people, and failing. I am alway trying to please other people making them happy while I am not. I am a emotional eater junk is my choice of food. I must get a hold of myself do to health reason.